William is evergreen. Liam is white hot. 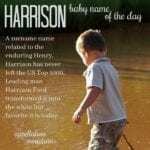 So how ’bout this surname spin? 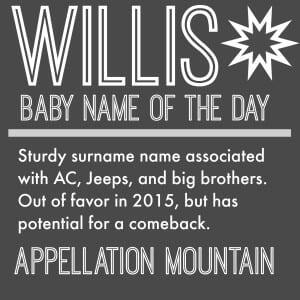 Thanks to Virginia for suggesting Willis as our Baby Name of the Day. If you’re of a certain age, this name almost certainly goes along with a phrase. 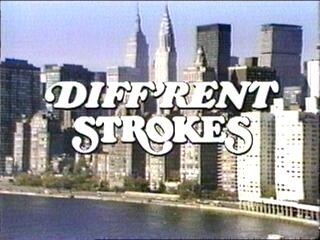 Sitcom Diff’rent Strokes debuted in 1978, and ran for eight seasons. It was the story of wealthy Park Avenue businessman Phillip Drummond, who agreed to take in the sons of his former housekeeper when she passed away. The boys were from Harlem, and the move from their modest neighborhood to a luxe Park Avenue penthouse was the subject of many an early episode. The show was a massive hit, and that tagline was uttered – with many variations over the years – by Gary Coleman, who played the younger of the sons, Arnold. The Willis he was talking to? His big brother, Willis Jackson, played by Todd Bridges. But this was no Gossip Girl. Despite some displays of privilege, the boys and their adoptive sister, Kimberly, have mostly everyday problems – bullying, dating – along with quite a few episodes about racism and discrimination. According to the character’s bio, he was born in 1965 – the same year child actor Todd Bridges was born. In 1965, Willis was fading, but still a perfectly plausible name for a boy born in the US. The name was a Top 200 staple through the 1930s, leaving the Top 1000 after 1993. Just 69 newborns were named Willis in 2013. That’s not quite an all-time low, but it does suggest that this name is trending towards obscurity. Athletes, politicians, businessmen, and more round out the list. And then there’s one more association that seems all-boy Americana. In 1908, John Willys went into the automobile business. By 1912, the Willys-Overland Motor Company was second only to Ford Motor Company in terms of domestic sales of new vehicles. During World War II, Willys manufactured General Purpose vehicles – which eventually became known as Jeeps. The Jeep name survives, but Willys disappeared in the late 1960s – at least as new cars. That’s a picture of a Willys model at the top of the post. 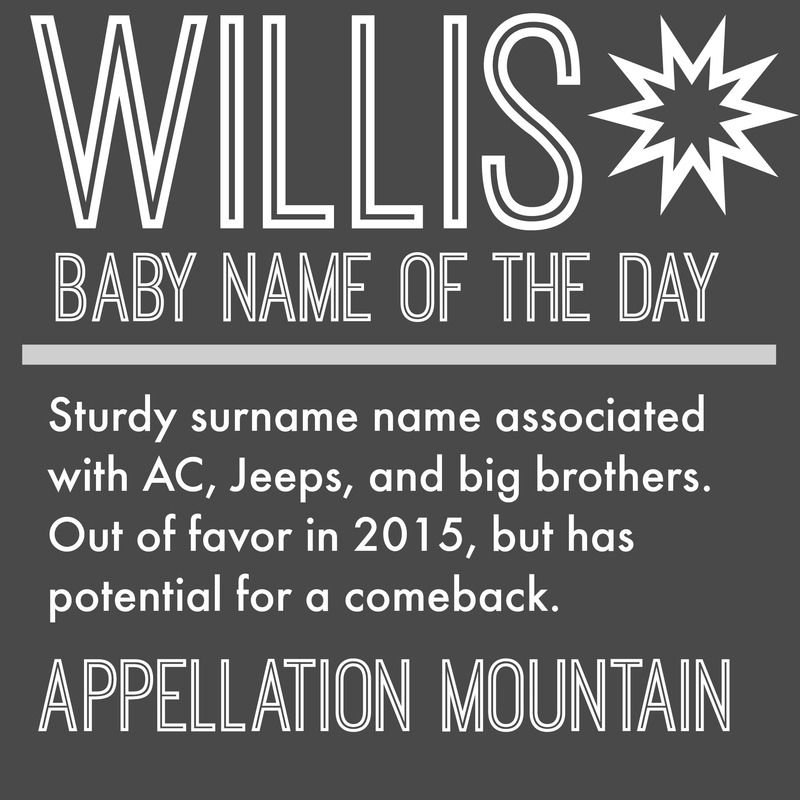 While Willys pronounced his name just like Willis, there’s a healthy debate about just what’s correct. Apparently, American servicemen saw the name on their Jeeps about pronounced it phonetically: Willies. Still, I think the iconic image of the World War II Jeep is probably a plus for this name. 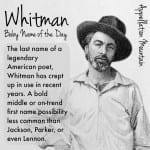 Conventional wisdom says that names come back into fashion about a hundred years after they were last in use. If Willis was most popular back in the 1890s, hasn’t this name missed its shot? Maybe. But conditions are favorable for a Willis revival right about now. William remains a powerhouse of a name – classic and popular at once, and Willis shares desirable short form Will. We’re embracing ends-with-s surname names, like Brooks and Ames. W surnames are having a moment, from wild Wilder to presidential Walker. If you’re after a name both familiar and rare, one that shares traits with stylish names but remains off-the-radar, Willis is one to consider. What do you think of Willis? 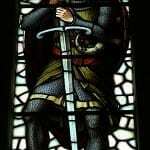 Is this an overlooked name, one due for revival? Or does it still feel stuck in the past? I love Willis, but I’d need an Arnold…and I don’t like Arnold.